REARING TO GO: The prefects from the board hold the banner on their humanitarian trip to Siem Reap, Cambodia. 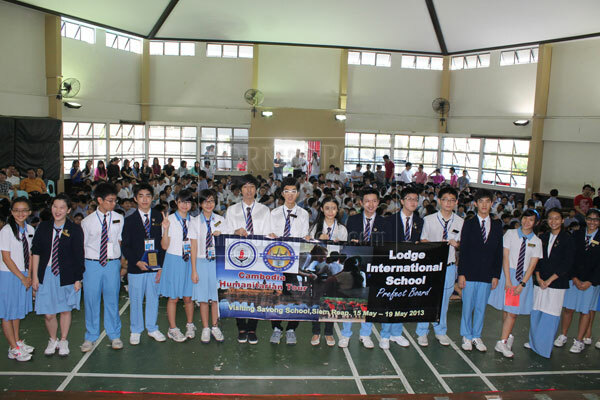 KUCHING: Students from the Prefect Board of Lodge International School embarked on a four-day humanitarian trip to Siem Reap, Cambodia yesterday. While there, the team, comprising 11 prefects from Year 10 to Year 12, will be visiting the Savong Home and Education-Cambodia (SHEC) as volunteers to help the orphanage and school. According to a press statement from the school, the team will share their knowledge in English language and computer skills with needy children of the school. During the trip, the students will visit Angkor Wat, a World Heritage site. The team is headed by the Prefect Board head of community service, Jason Sim, accompanied by two teachers Chee Wong and Ilbeth Lim. The Savong Foundation, a non-profit organisation, is responsible for SHEC and The Savong Student Centre. Its mission is to support and empower underprivileged youths in northern Cambodia through education, shelter and healthcare. The Savong Foundation is funded by private donations and the goodwill of volunteers. For this trip, the prefects from Lodge International School will be staying at a guest house hosted by Svay Savong, founder of the foundation. Besides spending time with the local people, this trip is also to instill the spirit of volunteerism in the students and for them to experience immersion into Khmer culture. The Prefect Board organised a food sale to raise US$1,000 for a house building project at Savong School for 40 children and collected used book for the orphanage. “What you do makes a difference.” said Lodge International principle Lim Kiong Hua. Lim presented the school ambassador badges to prefects taking part in the trip besides handing over the US$1,000 raised to head of projects, Jason Sim.